After 4 years of war, Speedway owner Capt. Eddie Rickenbacker had other ventures he wished to pursue so he expressed a desire to sell the Speedway. Three time winner Wilbur Shaw didn't want to see the Speedway go the way of a housing development, so he looked for interested buyers who would preserve the Speedway. He found such a buyer in Anton "Tony" Hulman Jr. and in late 1945, he and Wilbur negotiated with Capt. Rickenbacker for purchase of the Speedway. It would take a miracle to get the Speedway ready for a race that was a short 7 months way - the Speedway was in terrible condition and all the logistics in preparing for and running the race had to be completed in that time. The 1946 ticket continues with the car or track design as in previous years. It is the same **dimensions (4 3/4" x just over 2 1/3") as the 1935-41 stubs and like the 1940 unused ticket, there is a perforation between the gateman’s stub and the rain check, but not between the gateman’s stub and the portion to the left. Wilbur Shaw now appears as President at lower right and T.E. Meyers Vice. Pres. remains on the rain check and will remain so through 1954. The ticket maker remains "Weldon, Williams & Lick, Ft. Smith, Ark.". There appear to be two different general admission tickets for 1946. One that is the previous size as 1941 (1 3/4" x 3 1/4") and one that is more square measuring 2" x a little over 2 1/4". The latter will become the general admission standard for 1947 to *present. The square portion of the general admission ticket below does not have the year on it while the smaller portion does have the year. Note that both the "Press" and the "Complimentary" vertical general admission tickets have the serial number punched in them like the 1937, 1939 and 1941 (see the 1930-1941 tickets page). 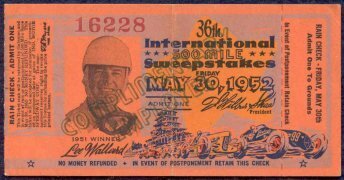 1947 marks the first year a picture of a driver appears on a ticket with Wilbur Shaw, three time winner and the current Speedway President at the time, being featured. 1946 winner George Robson may well have been featured on the ticket but as he was killed racing in September of 1946, the Speedway more than likely decided not to use his image possibly out of respect*. This is the first time a picture appears on a ticket* since 1912*. Except for 1981 and 1982, the winner or a driver will appear on the ticket from 1947 through today. The size remains the same as 1946 for the grandstand stubs through 1953 with a size change to 5 1/8" x 2 1/2" in 1954. Three perforations are now present on unused grandstand seat tickets: between the Admission To Grounds and Gateman’s Stub, the Gateman’s Stub and the rain check and between the rain check and stub. This will remain so through 2015. Complimentary, Press, Participant, Official, etc. are the same except there is no perforation between the Admission to Grounds and the Gateman's stub but there is a perforation on the right side between the rain check and the stub. There is also no diagram of the track on the back of these tickets. Note the Complimentary ticket is stamped "Employee" on the back. Also note there are two serial numbers on the unreserved bleacher ticket but only one on the general admission ticket. The (square) general admission stub remains the same size and now has a legal statement on the back which will remain so through 1955. As both the grandstand and square type general admission tickets were for general admission it is not clear why two types were needed. 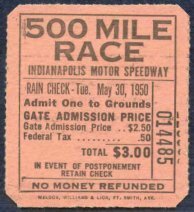 The 1948 ticket marks the first time the ticket features the previous years winner, Mauri Rose. "Employee" is now printed on the front instead of stamped on the back of the Complimentary stub. 1949 features driver Jimmy Jackson with his car and the Borg-Warner trophy. 1949 marks the only year where the general admission, complimentary employee, etc. 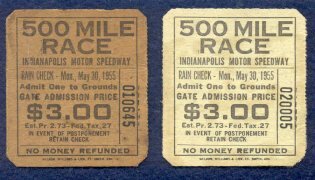 ticket is virtually identical to a grandstand ticket (in this case the 1948) with the necessary changes for 1949 the only difference. Note that one of the grandstand stubs has the box, row and seat penciled in which may indicate it was a replacement ticket. In 1954 the size changes to **5 1/8" x 2 1/2". 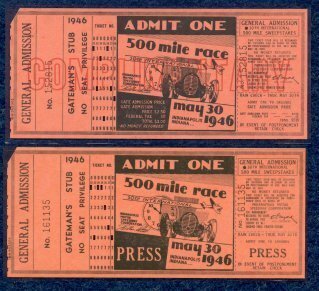 Note that the 1954 "Press" is also a grandstand stub. 1955 sees A Hulman Jr. Chairman printed at lower right. The name on the rain check is removed and remains so through today. It is uncertain if one of the 1955 general admission tickets shown above is discolored, faded, etc., but it appears there are two colors of general admission tickets for 1955. Stubs from 1946 through 1955, while easier to find than pre-war stubs, are still tough to find in excellent condition with the 1946 the toughest with each year following getting a little easier to find, but not by much.